One form of light pollution is of course the overhead washing out of the sky due to street lights en-masse shining up into the atmosphere, which is then reflected back down to earth by water-vapour in the air. Filters are used to help astronomers with this kind of light pollution, and when it is impractical to visit a location that is away from the source of the lights. When the full Moon shines high in the sky, you instead choose brighter objects to observe, such as the planets and more dominant stars and constellations. Of course you can take time instead to appreciate the beauty of the Moon herself. The other form of light pollution that causes bad contrast in telescopes which we do have a little more control over, is stray, unwanted light coming into the end of the telescope at an angle from nearby domestic lighting; be that from streetlights, decorative garden or patio lighting, house lights, the next door neighbours pesky football pitch floodlight, or the gentler but still invasive light from the Moon. Well at least the Moon has every right to be there. You can close curtains or turn off un-necessary house lights, garden lights, and have a friendly word with the neighbour. You can even write to the local council to see if they will do something about the nearest streetlamps. Or you can purchase a “dark-cap” or “dew-cap” to wrap around the end of the telescope to help prevent strong side-lighting. I often use a large patio-table umbrella opened up and laid on its side to shield me from a particularly annoying streetlight. The main issue here is that the interior surface of the telescope tube, even when painted matt black by the manufacturer, still has a degree of reflectivity that causes the light to scatter and bounce its way down the tube, and into the eyepiece, where it adds a subtle lightening of the background, and this reduces the resolution and contrast, and therefore the enjoyment of observing stars, and can make viewing deep-sky objects far more difficult. A very effective and permanent solution to employ with open tube telescopes such as Newtonians, is the addition of materials with low light reflectivity to the inside surface of the telescope tube, and this procedure is known as “flocking”. Read my latest article on How to flock the interior of the Orion Skyquest XT10 newtonian reflector OTA tube. 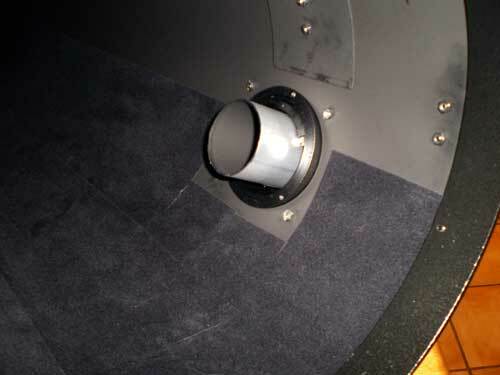 In this article I describe how to add black flocking material (ProtoStar Hi-Tack Flocking Sheets) to the interior of my Orion XT10 newtonian reflector telescope tube to increase the contrast when observing the night sky. This entry was posted on Monday, October 20th, 2008 at 10:41 pm	and is filed under Modifications. You can follow any responses to this entry through the RSS 2.0 feed. You can leave a response, or trackback from your own site. That’s why telescope are very useful in astronomers so that they can know what is happening around our planet. Great post on Astronomy and telescope. Learned a lot, thank you! I used astronomic telescope once at a astronomic station in our country, and saw the beautiful scene of planets. Learning about the space is really exciting subject for me, my dad has recently purchased a telescope and it provides amazing view - I have no words to describe it. Very great post. I simply stumbled upon your blog and wanted to say that I have truly enjoyed browsing your blog posts. After all I will be subscribing to your feed and I am hoping you write again soon!